Cobalt Statice, Lush Greenery and more. 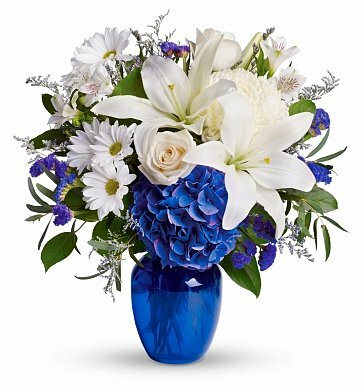 Beautiful in Blue Bouquet is a hand delivered gift. These gifts are delivered by one of our local design centers located throughout the United States and Canada. Same day delivery is available for most gifts when ordered before the cutoff time. The cutoff time for Beautiful in Blue Bouquet is 2 PM in the recipient's time zone. Flowers and delivery were exceptional! I have used 1 Stop several times over the past six months. The arrangements have been beautiful and just as pictured. Delivered on time. I love this company! They do not charge much for the quality of the service they offer! And always the flowers are very beautiful! Very pleased with the presentation. Loved the quality of the product when it arrived for the service. I will be ordering again from you because of the service I received. We ordered this arrangement for a family going through a very difficult time. At the same time we really did not have time to search and select which store would do the best job. We found this web site on the internet and ordered the arrangement. I was very impressed with how easy it was to find an arrangement. To my surprise the arrangement arrived at the family house the same day only a few hours after I ordered it. I will definitely use this service again. Sorry, I meant to contact you about the Bouquet, and let time slip away. The only thing I can say is.....I was not disappointed. I can't put into words how happy the family was. Even though I wasn't there, I was told how beautiful they were, not to mention, how happy they were to receive this surprise. I send flowers to my sister in Phoenix for special occasions and she is always pleased by the presentation. She has even sent me photos so I can see how beautiful the flowers are, as I live in Florida. Beautiful. Patient sales representative since I kept changing my mind. My Daughter and Son-in-law were so pleased with the flowers. They enjoyed the beautiful smell throughout their home. They received just what I ordered. The flowers were beautiful. Great job. This was a gift for my daughter in law. She loved the colors, the arrangement and the fragrance! I use this florist whenever I can. I didn't see it but I was told it was beautiful. I thank you for a great job done. The flowers were stunning. There was a similar arrangement - same color blue - but this was by far the best! We will definitely use this florist next time we are in need of beautiful flowers! I am extremely happy with the flower arrangement you provided for the Jan. 10th funeral. It was beautiful! I received great customer service and a very high quality product at a reasonable price. I recommend highly! The recipient of the floral arrangement absolutely loves it. She has the vase of flowers on her bathroom vanity, and said they are as fresh looking as the day they arrived. She was very happy to receive them. On time and beautifully presented! My friend loved the flowers. No complaints here. Thank you for being so prompt. I really appreciate everything you did. And, whomever I talked to on the phone was very understanding and polite. My aunt and uncle were amazed at the beautiful floral arrangement and the wonderful SMELL! They sent me a picture of the arrangement and I must say I too was blown away. Thank you for exceeding all expectations (I don't like ordering online, however the customer service and presentation of their product more than exceeded my expectations). It was easy and delivery was fast... had to order last minute and you delivered in service and presentation. Thank you! Absolutely gorgeous! Was for my mom for her birthday and she loves blue! She sent me a picture. Thank you for making her day so special. Very fresh and balanced bouquet. I will be ordering from you again in the future. The flowers were beautiful and arrived fresh and perfect. During the difficult time of my father's funeral, I am glad that I didn't have to worry about the flowers being just right. Thank you. I've purchased this item many times on behalf of my company for various occasions. I've been told it is a beautiful arrangement and the vase is a great keepsake. I had ordered birthday flowers for April 24th to be delivered and left at the door for my friend who lives at Dayton, but had quite forgotten that she and her husband had gone away before that day until the following Monday, when they returned and picked up her flowers. Pamela loved them and said they were fresh and beautiful! I was pleased to receive an email from your company informing me what had happened, so I have no hesitation recommending your services. Just perfect with lilac and white colors and made my friend's 50th birthday very special. The gift of flowers (beautiful) with chocolates (individually wrapped so just right for everyone) and with the Mylar balloons (as the operator reminded me -- I needed two, one for each child even though the flowers were for their mother) was just perfect! I have ordered from your organization for years now and have never even been slightly disappointed - raves all around! Flowers were beautiful as expected, but I wanted to comment on the customer service. The recipient was unexpectedly out of town on the day of delivery. We called GiftTree.com who connected directly with the destination vendor (Coulter Florists in Maryville TN). They had already delivered the arrangement, but were happy to pick it up and deliver a new arrangement the next week. I appreciate the enthusiastic and helpful response of both GiftTree and the vendor. I will definitely use both in the future. I did not see them in person but was told by those who received them that they were beautiful. They brought comfort and that was important to me. This arrangement was sent to a fellow employee while he was hospitalized. He was very pleased with the gift and I could not have been happier with the bouquet. Beautiful and not too feminine!